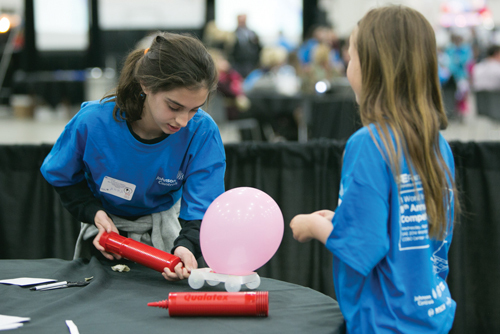 The possibilities were endless as engineers and technical experts gathered to explore “Creating New Possibilities” at the 2014 World Congress of SAE International, held at Detroit’s Cobo Center. Above: The SAE 2014 World Congress meets annually at Detroit’s Cobo Center to learn about new strategies, programs and technologies within the automotive industry. SAE event planners say they are working to steer the industry and its future cars and trucks to more efficient operations that will save energy and fuel. Among the mandated goals is the challenge of achieving CAFE standards of 54.5 miles per gallon by 2025. “There is power in this group to support and build a larger, stronger and sustainable industry going forward as we begin ‘creating new possibilities,’” said General Chairman Chung Kook Park of Hyundai Motor Company. The sessions were attended by 11,066 engineers and experts from 54 countries. Their number surpassed the 10,558 who attended in 2013. They arrived from nations including South Korea, Germany, Japan, China, Canada, United Kingdom, India and Italy. They saw and heard presentations by representatives of 190 exhibiting companies, including 48 event sponsors. More than 1,600 attendees participated in the ride and drive, which featured more than 20 different vehicles. They included the Hyundai Genesis, offered by the event’s host company. The Tier 1 strategic partner for the event was Delphi. Future technologies were discussed in Cobo’s handsome and roomy new AVL Technology Leadership Center. Powertrain solutions – an industry work in progress – were the subject of the panel “Consumer Driven Powertrain Innovations.” The speakers, all auto powertrain chiefs, agreed on the benefits that could be derived if the United States switched to the same blend of high-octane fuel that is sold in Europe. Panelist Robert Lee, vice president and head of engine powertrain and electric propulsion engineering at Chrysler Group LLC, told the audience that a fuel shared with Europe would allow automakers to cut costs by designing similar engines for Europe and the United States. Agreeing with him were panelists Steven A. Kiefer, vice president, global powertrain at General Motors Corp.; and Bob Fascetti, Ford Motor Co.’s vice president, powertrain engineering. “In 2013,” added panelist Naoki Sugimoto, senior program director of R&D in Honda’s Silicon Valley Lab, “41 percent of U.S. venture capital was invested in Silicon Valley.” He said Honda has been doing computer science research since 2005 and plans to open an innovation lab in 2015. Among many other auto companies in Silicon Valley, he mentioned Mercedes Benz and BMW. Panelist Dirk Hoheisel of the Robert Bosch LLC board of management predicted that automated driving will come step by step. It will begin with parking assist, then traffic jam assist, then adaptive cruise control. He said future mobility will be through the cloud, with important data stored outside the vehicle on Internet computers. The system will provide information, such as traffic conditions ahead. He predicted that fully autonomous vehicles would be available in the next decade. The panelists agreed that computers in automobiles will evolve dramatically in expertise. “A powerful visual computer will be at the heart of tomorrow’s modern car,” said Rob Csongor, vice president of automotive at NVIDIA, a global technology company based in Santa Clara, Calif.
Csongor discussed the Tegra K1 graphics developed by NVIDIA. They will include next-generation infotainment systems with a number of breakthroughs. 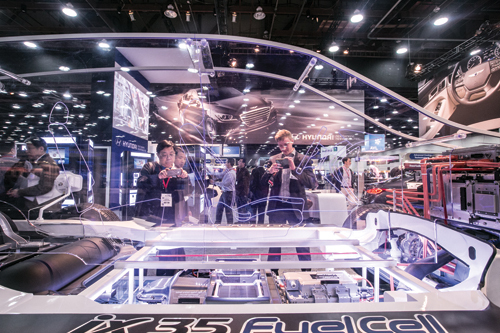 SAE World Congress participants test the latest automotive-related gadgetry during the event. Manufacturers and media alike are introduced to new concepts. Students also get to try their hand at making projects on site. Another panel discussed the future of connected vehicle technologies including infotainment and V2X (vehicle connectivity). The title was, “New possibilities with the connected vehicle.” Panelists covered the rapidly increasing use of feature content and the problems of ensuring data integrity and consumer satisfaction while development time windows are constricting. “How will manufacturers encourage V2V (vehicle to vehicle) and V2I (vehicle to infrastructure) into their safety system architecture?” asked Bruce M. Belzowski, director of automotive analysis at the University of Michigan Transportation Research Institute (UMTRI). He discussed the levels of safety innovations, from function-specific automation to full self-driving automation, in which the vehicle performs all safety-critical driving functions. A demonstration of Toyota’s futuristic new zero-emission i-Road vehicle was presented at the booth of the Washington-based Information Technology Innovative Foundation (ITIF). The demonstrators also discussed novel mobile platforms. The i-Road is a tiny three-wheeled, front-drive vehicle that seats two people in tandem. Toyota calls it a Personal Mobility Vehicle (PMV). Its fully enclosed body is only 7.7 feet. Each front wheel features a 2.7 hp in-hub electric motor powered by a shared lithium ion battery. Toyota says its driving range is 30 miles. World Congress exhibitor Infor says it is the world’s largest provider of cloud enterprise applications and services behind Oracle and SAP. The New York City-based firm, with operations in 41 countries, offers solutions to many of the world’s largest companies, including Ferrari and Nissan. Infor announced its new CloudSuite at the Congress. The company’s spokesmen claim the new program is the first group of industry-specific applications available in the cloud. The term refers to services that computer companies offer, under which programs for computing and data are stored in giant servers provided by a company such as Infor and shared among many users. “The cloud itself,” says Infor’s Jeff Rheingans, “is a way to access solutions through the Internet and make them available to customers throughout the world.” Working from Infor’s Ann Arbor location, Rheingans is senior director of software development. The new CloudSuite, according to Infor, helps users respond to their customers faster, supply the right quantities at the right time, adapt to flexible production, operate more efficiently and get total supply chain efficiencies. Rheingans explains their company has different solutions for automotive suppliers, as well as for specialty vehicle makers and the aftermarket. The company’s reps claim that in the next five years, 47 percent of companies plan to move mission-critical applications to the cloud. At present, Rheingans says, more than 80 percent of the world’s largest automotive suppliers are running infor applications for easier maintenance and lower total cost of operation. Infor boasts of having customers in 194 countries. In the area of powertrain technology, nine of the engines named in the Ward’s Auto World list of the 10 best engines for 2014 were equipped with components and systems from MAHLE Powertrain LLC. From local headquarters in Farmington Hills, General Manager Hugh Blaxill predicted that MAHLE entries will be on the top 10 list again next year. Blaxill explained that MAHLE personnel are consultants on aircraft and marine as well as automotive engines. “We do a lot of diesel work and we’re expecting to do more,” said Blaxill. “And we’re getting into electronics.” The company also is slated to handle work on the new version of the Chevrolet Cruze, powered by an electric engine with an auxiliary gasoline engine. MAHLE announced recently that the Behr Group, a leader in vehicle air conditioning and engine cooling, was integrated into MAHLE as the Thermal Management business unit. MAHLE Powertrain LLC announced that it has partnered with Catagen to house the first Maxcat machine at their Farmington facility. The large machine can recreate engine exhaust gas composition, flow rates and temperatures to replicate an engine dynamometer-based test. In the area of engine technology, the exhibit at IAV Automotive Engineering Inc. included a Chrysler 3.0L EcoDiesel DOHC V-6 engine and IAV’s 48-volt system. The company, with North American headquarters in Northville, is partnering with Chrysler on the award-winning EcoDiesel engine. It powers the 2015 Jeep Grand Cherokee and Chrysler Ram 1500. The system incorporates a 48-volt starter/generator and a 48-volt lithium-ion battery aimed at lowering emissions and boosting fuel economy. The goal is reducing the engine’s emissions, boosting fuel economy and calibrating on-board diagnostics. IAV spokesmen said their display encouraged chat sessions at the show, discussing powertrain and emissions, vehicle electronics and safety systems. IAV Group is an engineering and technical consultancy serving the global automotive industry. The Southwest Research Institute showcased its newly-created engine. An independent applied research organization in San Antonio, Texas, SwRI calls its innovation the Dedicated -EGR vehicle. It dedicates one cylinder to exhaust gas recirculation (EGR) and claims the advanced combustion concept is up to 15 percent more efficient than a baseline model year 2013 engine. The cylinder is run rich to reform the excess gasoline into hydrogen and carbon monoxide. SRI says the system improves combustion and increases knock resistance, allowing higher specific power at high compression ratios (in excess of 12.1). It enables downsizing while increasing thermal efficiency. SwRI claims its efficiency is similar to a diesel engine but at half the cost. “We feel it’s the (most) cost-effective, market-ready solution currently available,” says Terry Alger, PhD, the organization’s assistant director for engine, emissions and vehicle research. Among its characteristics, according to SwRI spokesmen, is that it fits almost any spark-ignited engine architecture. It fits comfortably into an existing engine compartment. It also complements other engine efficiency technologies, such as hybrids. During the World Congress, SwRI announced the launch of the Advanced Combustion Catalyst and Aftertreatment Technologies consortium. They invited OEMs and affiliated businesses to join. Henkel, the marketer of well-known products such as Dial soap, issued two press releases at the Congress. Its North American automotive headquarters in Madison Heights announced that it is installing a high-pressure resin transfer molding (RTM) system. The unit will focus on carbon-fiber and glass-fiber composites. The 2014 SAE World Congress featured speakers from around the globe, including Woong-chul Yang, vice chairman of Hyundai Motor Group. He was the keynote speaker at the annual banquet. He invited OEMs and suppliers to visit their facility so they can qualify polyurethane properties to see if their composite material is a viable option for future applications. An Automotive Material Intelligence Consortium (AutoMatiC) was announced at the Congress by Granta Design. The new industry collaboration is designed to help OEMs and suppliers in the automotive and off-highway vehicle sectors increase engineering productivity, lower costs, and improve product performance. The information technology firm was founded in 1994 as the work of two University of Cambridge professors in Great Britain. When used for electric and hybrid-electric vehicles, their charging systems could make it easier for drivers to charge car batteries and extend driving range. Rather than using plug-in charging stations, car owners would simply need to park over an inductive charging unit to trigger the process. At the HELLA display, they showed their LED Matrix Beam headlamp system. It’s an industry-first that automatically adjusts high-beam light patterns for other traffic and pedestrians. The automated system has not been approved for use in the United States. But it’s a success in Europe. There, the press calls it the best lighting system available, according to Steve Lietaert, president of HELLA Corporate Center USA Inc. in Plymouth Township. The system, now on GM and Nissan cars, uses camera-based technology to create glare-free “tunnels” in front of a vehicle. Drivers can use their high beams continually, without fear of blinding other drivers. The new headlamps produce glare-free traffic zones and their high beams also adjust to provide maximum lighting along bends and curves in the road. HELLA, a global supplier of innovative automotive lighting and vehicle electronics, recently won a 2014 Automotive News PACE award for its LED Matrix Beam technology. The award recognizes superior innovation and technological advancement by an automotive supplier. Also, HELLA and Audi have developed a new Xenon headlight and an LED headlamp with a static high beam for the A8 in the U.S. market. The company is working with Paul Vahle GmbH to develop wireless leadership. With annual fiscal year sales for 2012/2013 of about $6.9 billion, HELLA is among the world’s top 50 auto component suppliers. Headquartered in Lippstadt, Germany, HELLA has more than 30,000 employees at 100 locations in 35 countries. About 5,600 employees are involved in the field of research and development. Lighting is the company’s largest business unit. World Congress officials announced that Honda will serve as the host company for the 2015 event, scheduled for April 21 to 23. Its general chair will be Erik Berkman, executive vice president of Honda North America Inc., and its theme will be “Leading Mobility Innovation.” The show’s producers will continue working toward SAE International’s goal of uniting 138,000 engineers and technical experts in driving knowledge and expertise across a broad spectrum of industries. Previous articleThink Before You Type; Think Twice Before You Tweet, Hiring Experts Say. Julie Candler is a journalist who has authored hundreds of magazine articles on automobiles, transportation issues, travel and other subjects. A longtime automotive writer, she has covered the auto industry for more than 30 years. Her column, Woman at the Wheel, appeared monthly in Woman's Day magazine for 18 years. She was the first woman in the nation to write an automotive column for a major women's magazine.